It's monday and I have the post-party blues. This past weekend my baby girl had her very first birthday party. There was an abundance of pink, glitter, and red balloons. It was everything that a first birthday should be. When it comes to throwing parties for the girls, I try to play super-mum and make everything myself. After all, hand-made is always better than store-bought, no? Everything that you see in the following pictures were either made by myself or my sister. I must also mention my mum who cooked two tables full of main dishes that I forgot to photograph (oops). Seeing my two girls eyes light up that morning when they were greeted with hundreds of balloons and all the pretty food and decorations just made my day. It may have been my daughter's birthday but their giant grins were the best present I could ever receive. 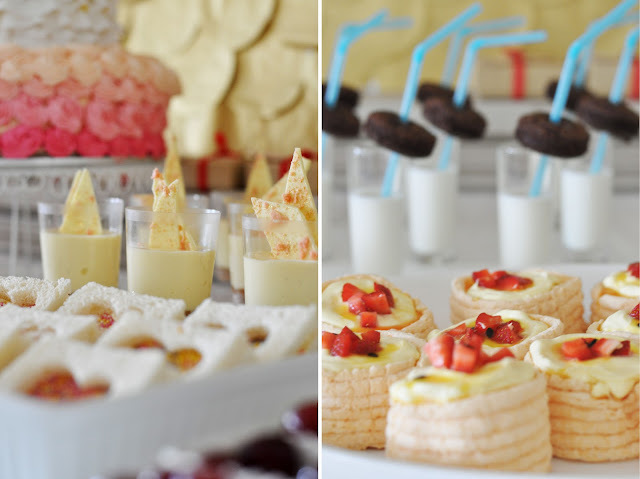 For anyone keen on planning their own party, full details at the bottom of the page. - The gold fish scale feature wall was made from circles cut out of tissue paper then layered onto foam board. It may look impressive but it really took no more than three hours to make. - Tissue paper pom poms are my go-to party decor. They're inexpensive, easy to make and looks great. Here's a great tutorial. - The glitter bunting was made with scrapbook paper and ribbons. I lined each flag with doubled sided tape and then applied glitter. The tape ensures a neat and uniform edge. - For the Happy Birthday garland, I first printed the words on the computer then traced and cut them out of thick stock paper. The rest is pretty straight forward, glue, glitter and string up. - My wonderful sister (baker extraordinaire) kindly offered to bake the birthday cake. The bottom tier is a classic chiffon and cream cake. The chiffon was baked in three layers of different shades creating an ombre effect. The top tier was intended to be a smash cake for the birthday girl. 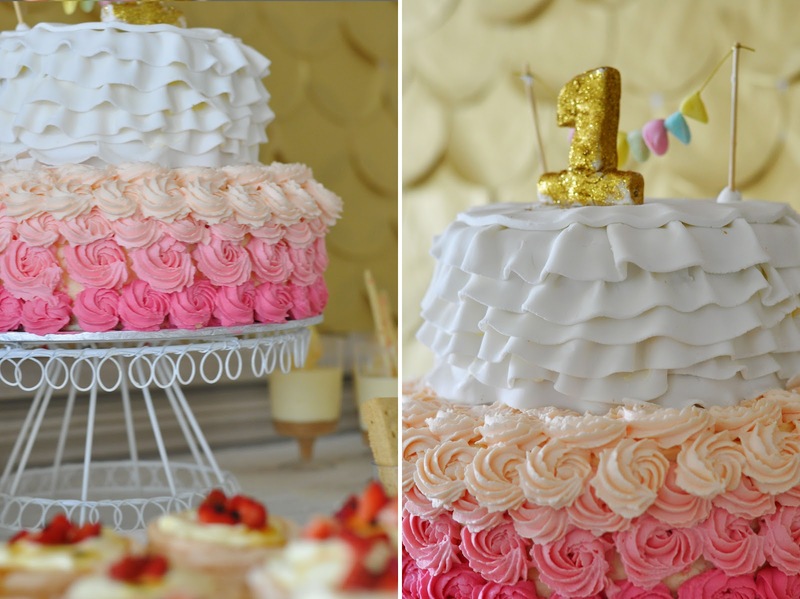 The ruffles along with the cake toppers were all made from fondant. - My sister also made the gorgeous macaron cupcakes. Funny story, we actually started off with 150 macarons but after consuming almost the entire batch we had to use the remaining 15 as cupcake toppers. - One of my favourite ways to serve strawberries is with a little drizzle of balsamic reduction. You can find the recipe here in a previous blog post. - These donut brownies were inspired by a similar milk and cookies display I saw on Pinterest. I used mini donut pans to bake my brownies in but you could easily use a bit of foil for the same effect. - Luckily for me, pavlovas are readily available at the supermarket in all shapes and sizes here in Australia. All I needed to do was add a spoonful of double cream and a drizzle of passionfruit syrup. But if you're interested in making your own pav, I have a great recipe here. - No-bake cheesecakes are a fast and easy alternative to your regular baked cheesecake. Plus with this method you can go crazy with presentation. The white chocolate shards on the cheesecake have edible glitter and crushed macarons set in them. - Store bought shortbread is a lot less fragile than homemade which makes them much better as party food. Here I paired it with David Lebovitz chocolate fudge sauce. See here for a homemade version. 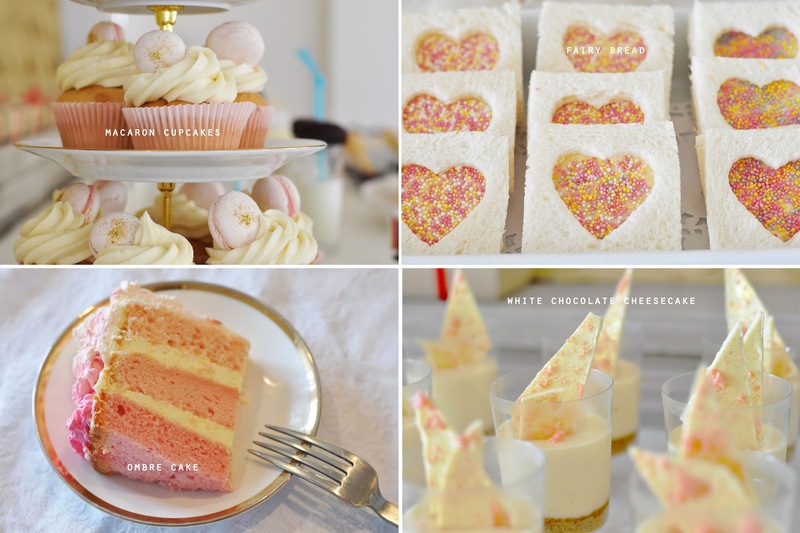 - The quintessential party food, fairy bread. No further explanation necessary. Wow. This is amazing! I don't think my wedding was as nicely decorated as this...haha. Jenee, her party was exquisite! It was so befitting and it looks like something out of a magazine. I applaud you! Everyone did a fabulous job. I have to admire these pictures again. hahaha Get some rest, but I know it's a good feeling. Just to see the looks on their faces was gratitude enough. What a beautiful cake it looks soo yummmy You must have spend so much time and effort in making all that delicious food. OMG Jenee, you are really a super mom ! Very great decor and the food not only look yummy but also cute and pretty. The appreciation from our little ones are always the greatest compliments. It just makes our hearts melt... Happy First birthday to your pretty daugther ! This is soooo cute. Both of you really look awesome and nailed it. Thank God you didn't hurt a bit. I have not stapled my fingers yet so let you know, lol. Have a great day ! um, can I have this for my birthday this month? HAPPY BIRTHDAY LITTLE AUD! What are the chances of me borrowing that gold fish scale wall for my photo booth at the wedding??? And I am so tempted to get your sis to bake our cake… do you think she would be interested? I AM SO IMPRESSED MISSY!!!!!! Now you have to hold a party for me… hehe. Glad you are having so much fun back with your babies and family! aww the cake looks delicious and love the decorations!! 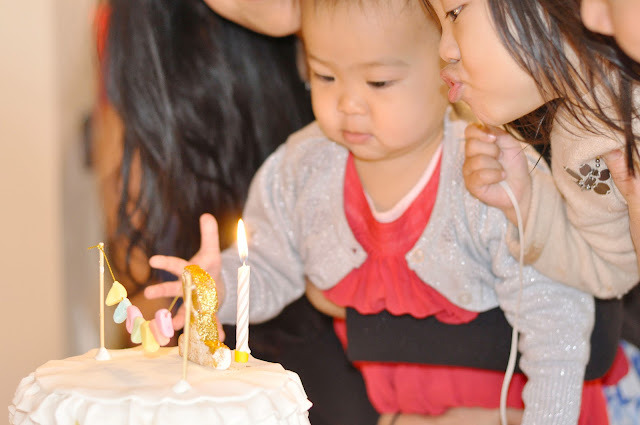 Happy 1st Birthday to you daughter! so cute!! Happy Birthday to your daughter! 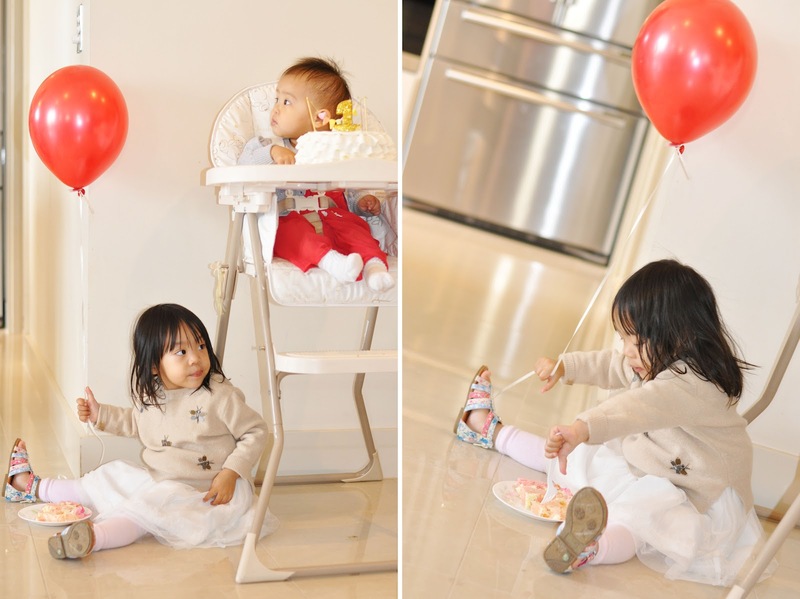 It looks like a wonderful party and you're definitely a shoe-in for Mom of the Year! Jenee, this party is totally insanely amazing! I cannot believe you made everything yourself and just love that ruffled cake--so so pretty. I will have to take a cake baking class after the decorating one is over as my baking skills really could use some help! Love this and your little girls are so adorable--so glad that it all went so beautifully! OMG, that is one of the most fabulous party displays I've ever seen! I LOVE that scale wall, and the food all looks amazing! WOW, just gorgeous! WOW! Ok let alone your daughter turned 1, I'd be happy if this were for my birthday coming up in Jan...I'll be 32. AHH. Wow this is wonderful! You should really be a professional party/event planner. Very well done my dear! the decorations are flawless and all the food looks SOO good!! wish i could have gone! ;) the cake is fabulous!! Wow, this is incredible! The cutest birthday decorations I have ever seen. Perfectly Pin ready! I'm just in awe!! I couldn't stop marveling at the incredibly beautiful and scrumptious delights on the table. They look like they're made by a professional catering firm. I think you and your sister should get into the party catering business. You totally have out done yourself on this party! I'm speechless, just beautiful! Love every little detail! love love love! Oooh i didn't know that you were into party planning too!! (its one of my hobbies!) every detail is so pretty and i'm in love with the gold accents esp the backdrop at the head table!!!!! love! thas a really amazing party! amazing pics and the cake is perfect!! This is absolutely the most gorgeous birthday ever! So so pretty, that is one very lucky lovely little girl! Happy Birthday sweetpea! Wow, you and your sister are to completely talented and creative! This is such a beautiful set up for any kind of birthday and it's so special that you did this for your daughter. I love love love your blog, I just started following you so I can keep up with your awesomeness! your two little girls are adorable!!!! What an amazing party! All the little details are absolutely gorgeous. Your daughters are so lucky to have you as a mother. Your one year old must have had the best time :) Love this. Such a lucky baby! A beautiful birthday party. Great achievement Jenee! I am blown away by the beauty you created. What a lucky little girl to have such a lovely party thrown in her honour. And also what lucky people to have been invited to such a gathering. Obviously much love here! Jenee, thanks for swinging by my blog and saying "hi", and I'm so glad you did - you are pretty much my party planning/decorating idol!!! Immediate new follower here, and I cannot wait to go through your archived posts - you are so talented! The party was just gorgeous, and happy 1st birthday to your precious little one! This came out BEYOND gorgeous. I can't believe how talented you are...you should seriously go into party planning. I'm pinning everything for inspiration! Omg! This is the BEST happy birthday party I have ever seen!! You should make of that a bussines! You are master of organazing parties! What a beautiful party! Everything looks stunning, oh wow, you have outdone yourself, your little girl is so lucky to have a mom like you! Wow! First, what adorable little girls. They are definitely lucky to have a wonderful mom like you. Everything is so beautiful. You know how to throw a party. Ohhh, that is adorable! 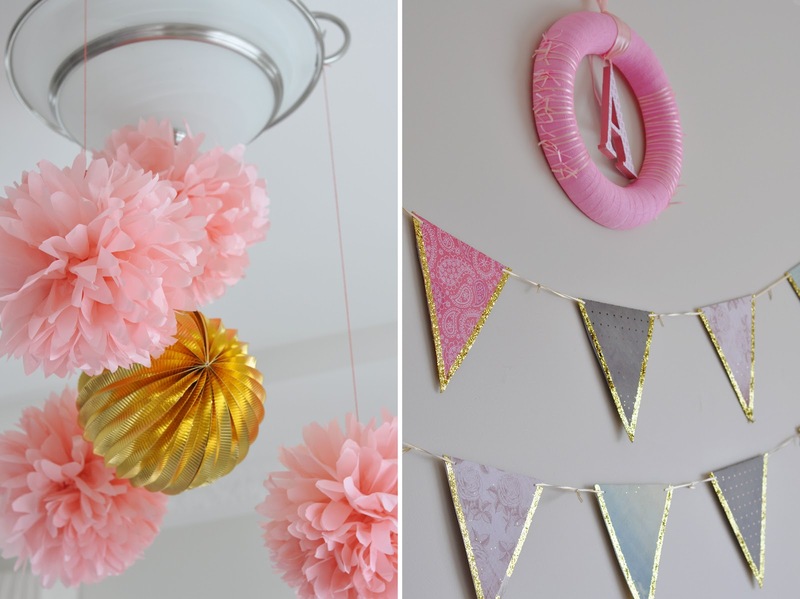 The decorations, your little girl, everything! I only hope that I can pull off as wonderful a first birthday with my own future child as you did! Belated to your youngest. She will be more proud and love you when she see all of this pics when she's grown up! Congrats for a successful party! This is the "most awesomest" Birthday Party I have ever seen, that too a Handmade/homemade one ! Congratulations to you for making it so beautiful,vibrant and creative. The photographs say it all. What am I loving right now ? The table decor with the food. You have amazing sense of color, the atmosphere is looking so vibrant and pleasing at the same time because of the pastel color theme. OMG you are amazing! This seriously looks professional, and I'm not sure what you do for a living but this is it! You have an amazing talent! Oh wow! 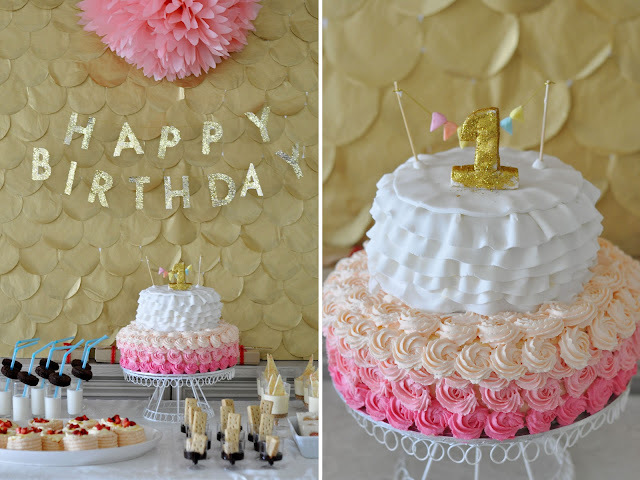 That looks like an amazing 1st birthday party! Stumbled across your blog and I love it! I am thoroughly impressed!! My 2nd daughter's birthday is in 2 weeks and I'm feel about 2 inches tall compared to you! I'm most impressed with the fish scale background. I'm really not crafty though..should I attempt it or not? How large of a board did you have to get? Did I say you're amazing?? 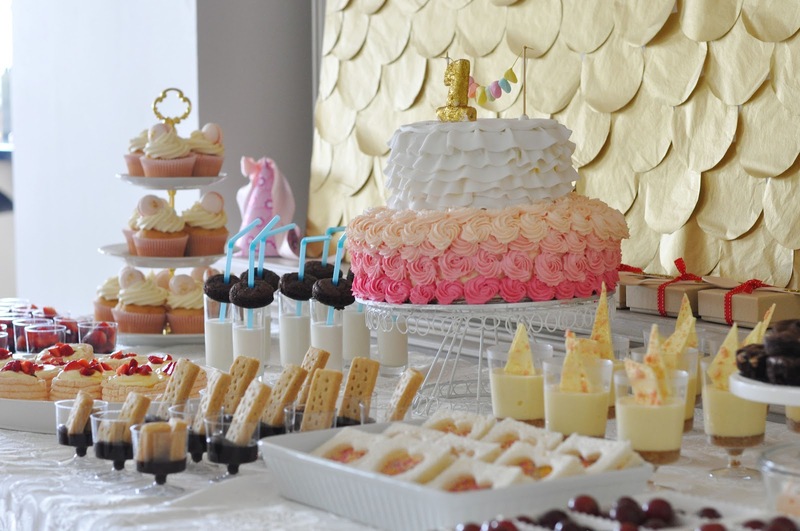 And the party looks amazing, there is so much attention to detail... you outdid yourself mommy! Aww... 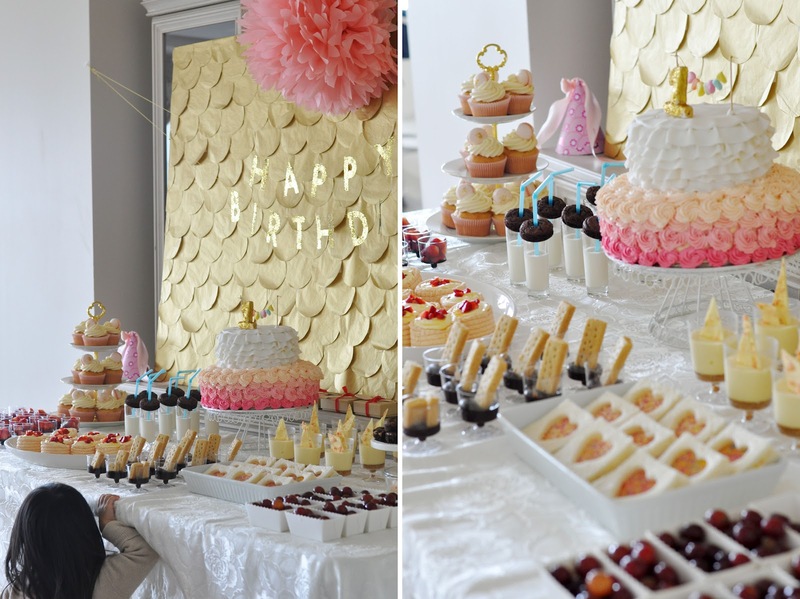 This is the perfect girly birthday party. Hats off to you- you really are a wonder woman for making this happen!